Little Rock National Airport marks its name change to Bill and Hillary Clinton National Airport with a dedication ceremony, which coincided with the completion of the first phase of the airport’s ambitious terminal redevelopment plan. 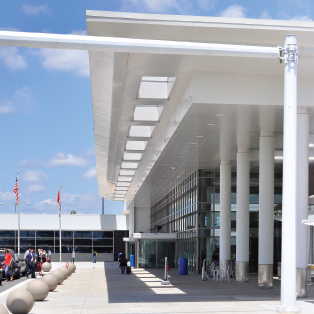 For Phase 1 of the terminal redevelopment program, led by Architectural Alliance, Garver performed aviation, mechanical, electrical, structural, civil, and plumbing engineering and periodic construction observation services. Fort Polk’s Wheelock Fitness Center gets updated with a new look and its HVAC system gets electrical upgrades. Garver teamed with The Ross Group to maximize the client's budget and complete the project six weeks ahead of schedule. After its first full year of operation, a wastewater treatment plant in Siloam Springs, Ark. achieves unprecedented nutrient removal. Garver developed, designed and implemented the enhanced nutrient removal program, enabling the plant's operation to remove 95 percent of the phosphorus from the influent flow, keeping more than 20 tons of phosphorus out of the Illinois River. The only known swing bridge designed as a cantilever in Arkansas reopens after nearly 80 years of wear and tear caused the bridge to close in 2007. Garver assisted the county in securing federal funds and restored the Judsonia Bridge without compromising its historical integrity.